Southern Cone Travel: More than Language: Saving Kaweskar Culture? More than Language: Saving Kaweskar Culture? Several years ago, I spent five days and four nights aboard the Skorpios III, a cruise ship that sailed from Puerto Natales on the “Ruta Kaweskar,” which paid symbolic homage to the so-called “Canoe Indians” of the intricate waterways of Chile’s southern fjords. While visiting the sea-level glaciers of the Campo de Hielo Sur, the Skorpios III made a brief stop at the remote Isla Wellington settlement of Puerto Edén (pictured above and below). Ironically, today’s revised Ruta Kaweskar – which I have not taken - is a four-day, three-night itinerary that no longer stops at Puerto Edén, home to the last remaining population of Kawésqar-speaking Indians. 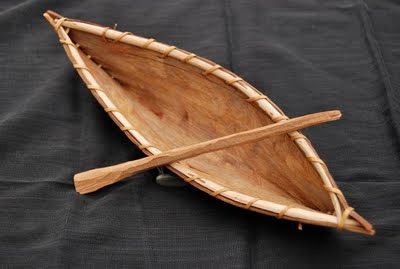 Once maritime hunter-gatherers, today’s Kaweskar (a word with several variant spellings; they are also known as the Alacaluf) are few. According to the 2002 census, there are only about 2,600, most of them based in living in Puerto Natales and Punta Arenas. Just 24 live in Puerto Edén, and only nine of them speak the language. This will not be easy. 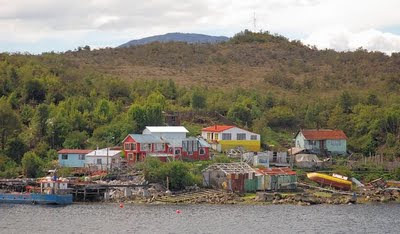 Puerto Edén might not even exist but for a small naval base and, while the remaining Kaweskar no longer paddle around in bark canoes, their existence is a marginal one. 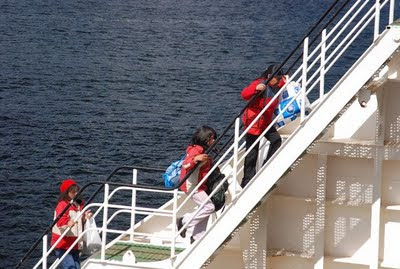 Alcoholism is sadly common, and their only reliable outside contact is the Navimag ferry that operates between Puerto Montt and Puerto Natales; it stops in each direction, and local residents (some of them pictured above, boarding the ship) get subsidized fares for their trips north and south. Whenever the ferry passes, the locals come aboard to sell their souvenirs, such as miniatures of the canoes that they once used for fishing and gathering. For anyone interested in learning about the Kaweskar first-hand, it’s possible to disembark at Puerto Edén, and accommodations and food are available. 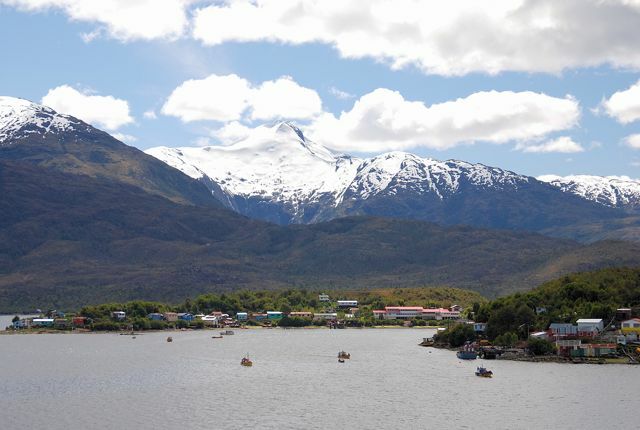 At the same time, it will require staying at least three days, until the ferry returns from Puerto Montt or Puerto Natales, or a week if continuing in the same direction. Meanwhile, Conadi, the university, and the community, which is an active participant in the new initiative, have set worthwhile goals. Whether they will be successful in overcoming centuries of neglect is open to question. If you have found this interesting or useful, please consider clicking on one or more of the AdSense links that appears here – always presuming, of course, that it’s a product or service that interests you.